Columbia University has an equity stake in this business pitched on “Shark Tank” (photo credit: Anna Stork). 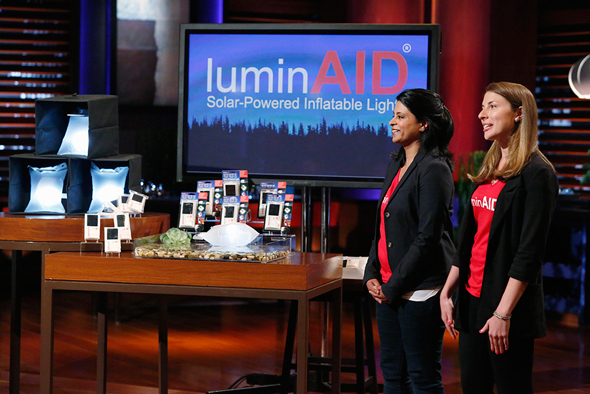 Recently, another Dartmouth graduate, Anna Stork, appeared on “Shark Tank” with her business partner, Andrea Shrestha. The two met while students at Columbia University’s Graduate School of Architecture and it was there that they came up with their business, “LuminAID.” Their initial product is a light that is charged by sunlight. The light can provide 16 hours of LED light and it’s both inflatable and waterproof. Can you see its applications to the American Red Cross and the Coast Guard, etc.? We sure can! It’s one of the best products we’ve seen to date on “Shark Tank” and that says something, because there have been a whole lot of good products and a whole lot of good companies. But we’re writing this post to raise a question to our readers. Columbia University owns a portion of the equity of Stork and Shrestha’s business. To be clear, we are uncertain if these two incredible young entrepreneurs worked on their product with Columbia’s resources, if they did so in a Columbia lab, etc. We’re not sure. And we understand that colleges often own the inventions of those who work for them — like professors. Even many graduate students collect stipends, so the argument could be made that this makes these universities entitled to a share of their businesses. But do you think it’s right? Do you think these colleges should be taking stakes in these businesses? Do you think Harvard should own a big piece of “Facebook”? We’re not sure where we stand on this particular issue. On the one hand, for those paying a whole lot of money for their undergraduate educations, we don’t feel strongly that these colleges that are receiving all of this hard earned money should get pieces of their undergrads’ businesses. But on the other hand, we respect that colleges in this nation are businesses, too. What do you think? Do you think colleges should own a piece of the inventions and businesses of professors, graduate students, and even undergraduate students? Let us know your thoughts by posting a Comment below. We look forward to hearing from you.